My mom just sent me this recipe. 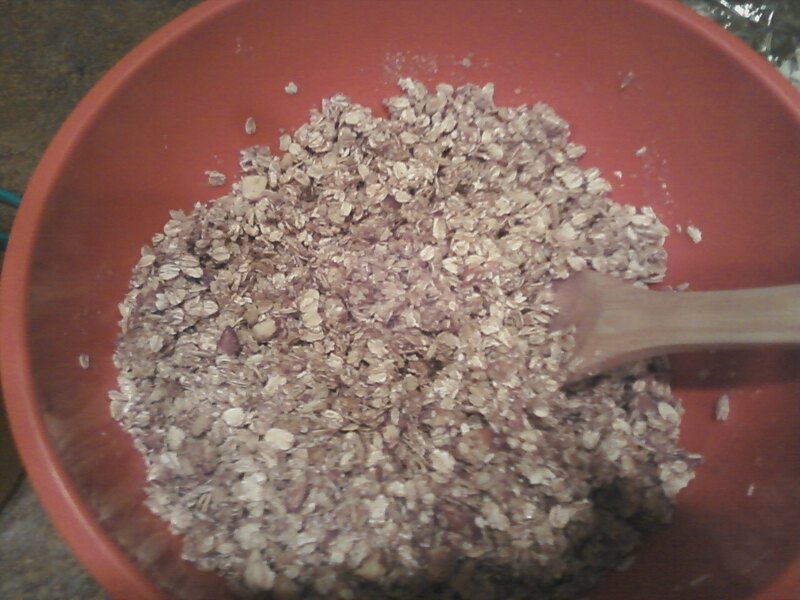 I had no idea my parents were making their own granola! Michael told me that this means they're just as hippy as I am haha. I guess the fruit doesn't fall far from the tree! This recipe came from a magazine in our local dentist's office- not sure which one so if anyone can find out so I can give proper credit, let me know! This recipe is really easy and yes, it does contain honey which is a hot topic issue among vegans. Without getting into it, I eat honey and enjoy it but I stick to local honey and not the "honey" stuff that's coming as far away as China. Local honey is supposed to help with local allergies. I'm not a doctor so don't quote me on it. I see honey as a natural sweetener that is a much better choice than white sugar. That being said, feel free to use agave nectar (use less than what's called for) or maple syrup. I'd like to try this next time with maple syrup but it's so expensive. 1. Pre-heat oven to 350ºF. Spray cookie sheet with cooking oil (I use a 13x9 inch pan and grease lightly with cooking oil). 2. Mix all ingredients except dried fruit. Place in the pan. 3. Bake 30-35 minutes (stirring every 10 minutes) until lightly brown. Remove from oven and cool. 4. Add dried fruit. Store in sealed container in cool place. Keeps for about 3 weeks. 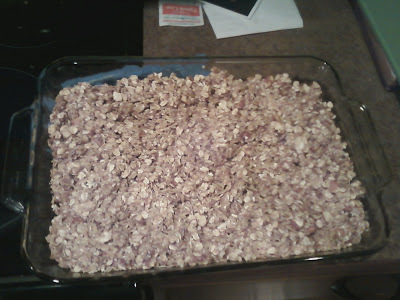 This is a terrible picture but it is browned and our house smells really yummy! 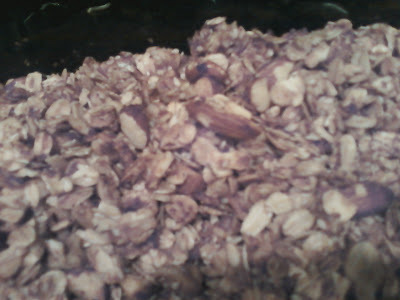 Feel free to use this as a base for granola and play around with different spices or additions. I bet shredded coconut or some cocoa powder or chocolate chips would be lovely. It's pretty sweet but I haven't had granola in awhile so maybe all granola is pretty sweet. 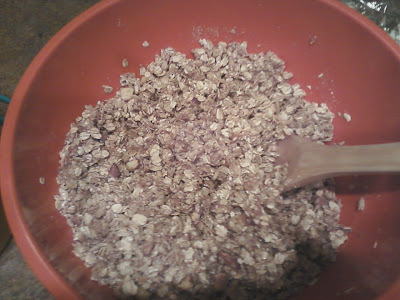 When I have granola with milk for breakfast I usually sprinkle on a few plain oats just to make it less sweet. *I used dates as I didn't have any apricots or cranberries on hand.